Order a taxi with just one click! Taxis are modernizing. Try it out! 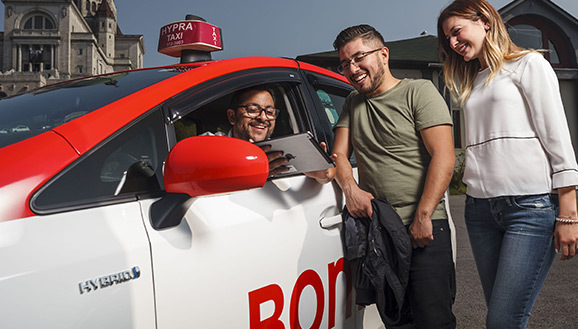 Your feedback matters: Rate your ride and enjoy the best service. No travel costs: Rides provided through the Taxi Registry feature no travel costs: the driver picks you up with $0 on the meter. There are over 10,000 drivers across the Island of Montréal. You’re guaranteed to order the nearest available taxi immediately, anywhere and anytime. Taxis meet stricter quality standards, as users now take part in evaluating the service. You’ll get a professional driver accessed through certified apps that respect your privacy. *Note: this service is currently only available on the Island of Montréal. © 2019 Bureau de taxi Montréal. Tous droits réservés.